Residents around town pull out all the stops when it comes to decorating for the holidays. Case in point: the famous (er, infamous?) Seahawks-themed spectacle known as the Hawk House in Kirkland. So here, we’ve compiled a list of some of the city's flashiest, most fabulous and most meticulous holiday light displays that will fill you with plenty of holiday cheer. Grab the whole family and head out for a joyful evening of oohing and ahhing at exterior illumination. 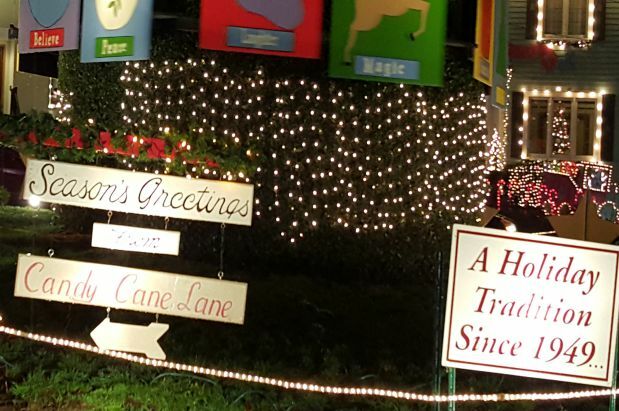 Ravenna’s Candy Cane Lane, located on NE Park Road, is nothing short of a holiday extravaganza. This display has been a local tradition for more than 50 years and will make you feel almost as though you’ve traveled to the North Pole--a very rainy North Pole--to visit Santa’s work shop. Don’t forget to bring a donation for the canned food drive collected at the end of the route. For more information go to ravennablog.com. Visitors enjoy local merry display by West Seattle's Menashe family. 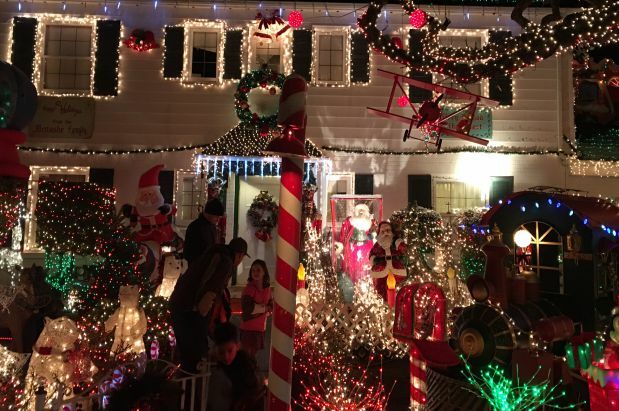 Located at 5605 Beach Drive SW, the Menashe family light display will make you feel like a kid again. This West Seattle tradition shines bright with more than 340,000 lights, blow-up characters and even a cheerful train.The Menashe family is collecting donations for the West Seattle food bank so be sure to bring a non-perishable food item. And who knows… you might even get to meet Santa! If you’re looking for more details on this light display go to westseattleblog.com. 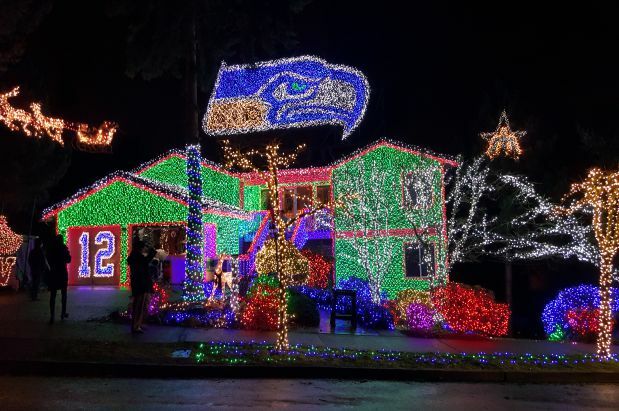 The Seahawks-themed light display at 11217 N.E. 100th Street is every 12's dream (and some neighbors' nightmare). Watch every Sunday through Thursday from 5 to 9 p.m. and Friday and Saturday from 5 to 10:30 p.m. as the lights glimmer and dance to music and highlights of some of the Seahawks’ most epic moments.Take a peek inside the house, too, as owner Anthony Mish has decked out the interior with stunningly elaborate miniature villages, including model trains and running waterfalls. The Hawk House is accepting donations for Children’s Hospital, Giving Tree and Toys for Tots. What's more, the house will be featured on ABC's "The Great Christmas Light Fight" show on December 21. To find out more about the 'Hawk House visit thehawkhouse.com. 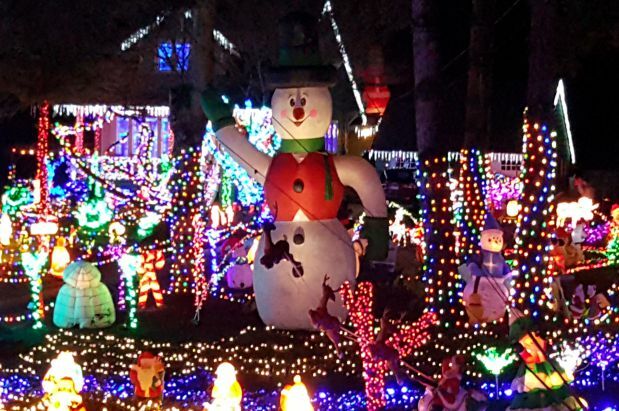 Located at 3908 SW Charleston, the Helmstetler family home will illuminate your evening with their musical dancing display. Tune your car radio to 101.9 and watch with wonder as the lights twinkle in time with each song. Join them on Christmas Eve for free hot chocolate and merry making. The Helmstetler family is accepting donations of money and dry goods for the West Seattle Food Bank and the Northwest Parkinson Foundation. You’ll find more information at westseattlelights.com. Join Bothell’s Keener family as they wave, dance and hand out holiday treats at their elaborately illuminated display located at 16504 112 Place. Tune your radio to 91.7 as you drive through for an even more festive experience. Bring donations of money or non-perishable goods to help owners Jeff and Candice Keener spread holiday cheer to the Ben Towne Foundation and Hopelink. Visit keenerschristmas.com for even more joyful details. 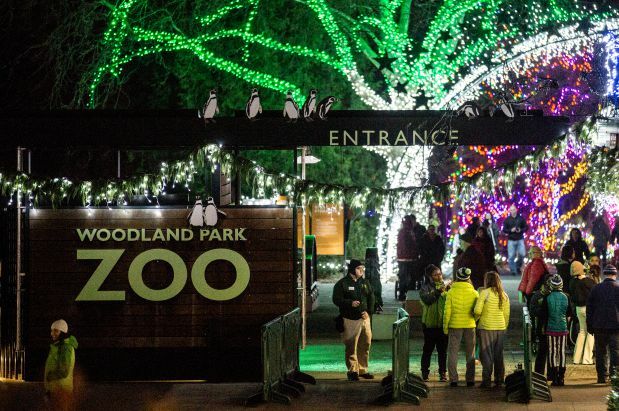 The fourth annual WildLights at the Woodland Park Zoo offers you an evening of holiday lights, treats and animals. Between now and January 3 from 5:30 to 8:30 p.m., enjoy special wildlife displays such as Jungle Lights and Northern Lights, faux snowball fights, and a holiday beer and wine garden for grown-ups. Santa will stop by the reindeer shelter on December 21 through December 23. Click to zoo.org to get your tickets and to find out more information.